The NBA may have the best off-season of all major sports. The rumors, the trades, the free agent acquisitions and star players constantly on the move make fans crave October when the season officially kicks off. Now after what seemed that most major news has been completed and most NBA rosters had taken shape, Kyrie Irving reportedly wants out of Cleveland. No one saw this coming. Irving wants out because he wants to be the focal point of a team. He wants to be the number one guy. He is not that in Cleveland with LeBron James taking up most of the attention. Irving being traded this off-season will be a complete blockbuster. According to ESPN’s Brian Windhort (first to report the news) Irving has preferred destinations for his next team. Irving has listed the New York Knicks, San Antonio Spurs, Minnesota Timberwolves and Miami Heat as teams he’d like to play for. None of this matters since Irving does not have a no trade clause and cannot dictate where he’d like to play. If the Cavs are going to move him it will likely be to the highest bidder. Teams will lineup to pay a steep price for a 25 year old multiple All Star who is on a team friendly contract and about to enter the prime of his career. Irving has 3 years and $60 million remaining on his deal. For hypothetical reasons looks at potential deals for the teams that Irving prefers and a few dark horse teams. The Spurs will have interest in acquiring Irving but unfortunately do not have the assets for Cleveland to pull the trigger. The only player Cleveland would want would be Kawhi Leonard and that is simply not happening. The Spurs do not have any high first round picks either to make the deal enticing enough. Although a combination of Irving and Leonard would be intriguing to see, it’s not likely to happen. The Timberwolves have both the assets and the capability of surrounding Kyrie Irving with a good team. Jeff Teague was signed to be the point guard this offseason but he cannot be traded for 90 days. Towns and Butler will be untouchable. This trade makes sense as this gives the Cavs their best hope to build for the future if LeBron departs in 2018 as a free agent. Wiggins had his best season to date last year scoring over 23 points per game and has the potential to be a multiple all star. Dieng would be a serviceable big off the bench and the future picks can be added or traded for future assets. The Cavs would slide Wiggins in as the starting shooting guard next to Lebron. This would have been Cleveland lineup if they had kept Wiggins and did not flip Wiggins for Love on draft night four years prior. The Timberwolves would roll out a starting lineup of Jeff Teague, Kyrie Irving, Jimmy Butler, Taj Gibson and Karl Anthony-Towns. That team would be a top four seed in the Western Conference and could be a nice challenger as an upcoming franchise. Tom Thibodeau would have to have the team gel quickly but the starting five can compete with anyone in the league. For the Knicks, there are a couple of three team scenarios that could happen. The Knicks get their prize in Irving and pick up two quality bench players to add depth to the lienup. Irving and Porzingis would be the Knicks would bring excitement to MSG and bring the Knicks back to relevancy. The pick and roll combination would be as lethal as you’ll see in the NBA. A starting line-up of Irving, Lee, Hardaway Jr, Porzingis, and Hernangomez would be able to spread the floor and launch threes from all over the court. They would be able to create offensive mismatches and be a tough team to defend with Irving breaking down opposing defense. The Cavs replace Irving and Love with Melo and Bledsoe while adding a future pick. James has close personal relationships with both Anthony and Bledsoe and Cleveland can use that to convince him to stay since both will be under contract for the next two seasons. Anthony and Bledsoe will keep Cleveland’s championship window open next season. The Suns get a star player in Kevin Love that fits their roster perfectly. Phoenix is set on the wings with Devin Booker and Josh Jackson. The Suns are able to move Bledsoe as they have Brandon Knight and Tyler Ullis currently playing behind him. Adding Love may not the Suns a playoff team this season but they’ll be more competitive than people think as they contend for the 8 seed. Same situation here for the Knicks as above except the depart with second first round pick to make the Bulls absorb Love’s contract for salary cap purposes. The Cavaliers pair Lebron up with two of his buddies in Anthony and Wade. Wade still has enough in the tank for next season for Cleveland to continue to make a run at a championship. The Bulls are in full tank mode and they may be hesitant to absorb Love as Love may win a couple more games for them. However, they need a good player and Love can be the number one option to sell to fans. Adding an additional first round pick in next years draft is the main selling point for the Bulls to complete the deal. The Heat much like the Spurs do not have the assets to acquire Irving. The Heat can build a package around Goran Dragic, Justise Winslow and Bam Adebayo and future picks but is that enough for Cleveland? Probably not. Adding WInslow and Adebayo might be good for the future but gut feeling is Cleveland is trying to win now and want players who can help them win a title this season. 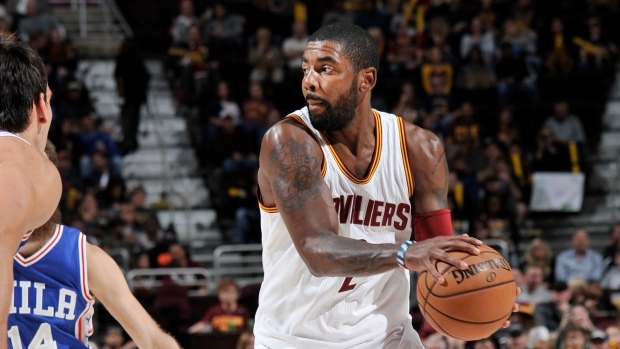 The two sleeper teams for Irving are the Philadelphia 76ers and Milwaukee Bucks. The 76ers have tons of future picks that are high picks in the draft. The 76ers can offer a package surrounded by Markelle Fultz, Robert Covington, Jahil Okafor and a first round pick. This scenario could happen if Cleveland is looking post LeBron possibly departing in 2018. This would give Cleveland future assets to build their team around. The 76ers can then start this season with a starting five of Kyrie Irving, J.J Reddick, Ben Simmons, Dario Saric and Joe Embiid. That’s a top 4 starting lineup in the Eastern Conference. The Milwaukee Bucks can offer Jabari Parker and Kris Middelton for Irving. Both Parker and Middelton can score the ball and defend. Middelton especially is top NBA defender. Pairing them with LeBron will allow for better matchups against Golden State. Cleveland will have an opportunity to play a small ball lineup of Shumpert, Middelton, Parker, LeBron and Love. That’s a lineup with a good amount of size and can disrupt passing lanes. This is an intriguing possible deal that could be looked at. Next Post: Is it time to let go of Mateo?